It has been a very, very long time since written a post (the last one I posted was from December - eek!). I apologize for the seven month long unintentional hiatus but I definitely needed the time to sort out a few things. As you can imagine, a lot can happen in seven months - I got engaged to person of my dreams, started a new job and, most notably, I am going back to school! After some deliberation, and with the support of my family and friends, I have decided to pursue a degree in Nutritional Sciences in hopes of becoming a Registered Dietitian. With all this change going on, I feel like I have lost touch with things I normally enjoy doing, such as working out. It has become increasingly harder for me to find pockets of time to do the things that bring me joy and even if I have the time, I am usually too exhausted to do them! It is a very vicious cycle as you can see. But July has given me the break I badly needed - I am only taking one class and work has lightened up tremendously - so I am finding the time and energy to #treatyoself. I took advantage of this glorious summer break to go for a run this morning and it reminded me of how much I love running! Running had become a way to deal with my anxiety and was something I looked forward to at the end of a long day. 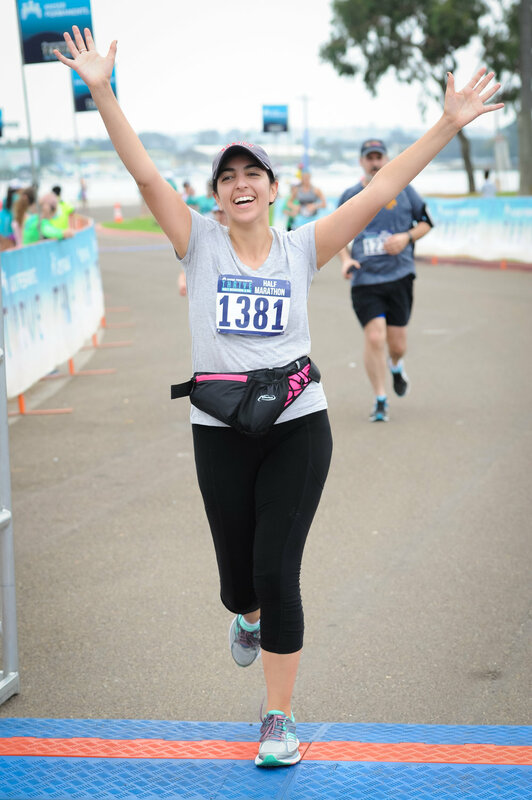 I loved it so much that I ran my first half marathon in San Diego last October! I ran the Kaiser Permanente THRIVE Half Marathon to raise money and awareness for Headstrong Project. Headstrong is a nonprofit that provides free, confidential mental healthcare to post-9/11 veterans. As someone who’s dealt with anxiety and depression, I know how unbelievably helpful treatment can be. Thank you to all the amazing people you donated to this cause! Together we were able to donate $900 and help better the life of a brave veteran. Training for the half marathon was a real test of self discipline. I relied heavily on the Nike Run Club’s 18 week program and ran at least three times a week, averaging about 15 miles per week. Towards the end of the program, I was running 10 miles at a time which was just as mentally challenging as it was physically. On race day, I was a ball of nerves beforehand. But once the race started, I was in my zone and ready to go! In all honesty, it didn’t hit me that I was running a half marathon until I hit Mile 11. After 2 hours and 28 minutes of running my heart out, I made it to the finish line to find Tejinder standing there with arguably the best sign possible. After laying on the grass and recharging for a bit, we made our way back to our hotel, the Bahia Resort, for a well deserved nap. I did, after all, wake up at 5 AM for the race! After napping for a solid hour or so, Tejinder woke me up and took me to Richard Walker's Pancake House to fulfill his promise of getting me pancakes after the race. And because I just wanted all the carbs at that point. I enjoyed a steaming plate of buckwheat pancakes and a frothy cup of hot cocoa. The staff at Richard Walker’s was as amazing as the food. They congratulated me on finishing the race and yes, I wore my medal all weekend. Once my stomach was filled with delicious pancakes, we decided to head over to Balboa Park for some sightseeing. We started at the Spreckels Organ Pavilion, then made our way down El Prado, stopping by the pond in front of the Botanical Building and enjoyed watching a magician in front of the Museum of Photographic Art, before finding a spot to sit near the fountain by the Fleet Science Center. It was an absolutely stunning day in San Diego and we enjoyed slowly, very slowly, walking through the park and watching all the attractions. I highly recommend paying a visit if you’re in the San Diego area. Flashing my medal in front of the Fleet Science Center fountain! The next day, I was pretty sore still but was feeling adventurous so Tejinder and I decided to rent a couple of beach cruisers and bike around Pacific Beach. We biked down Ocean Front Walk until we hit South Mission Beach before turning around and biking to the Pacific Beach Pier. Since it was Monday, the esplanade and beach were so quiet - it felt like we had to whole place to ourselves. By this time, we were getting a bit hungry so we stopped by Crushed on Garnet for some flatbread pizza because, of course pizza. After filling up on cheesy goodness, we somehow managed to find ourselves on the Bayside Walk. We slowly biked along the bay, enjoying the quirky and cute houses along the walkway and taking in the salty air. By the time we made it back to our hotel to return the bikes, it was time to catch our flight back to San Francisco. 1) I love traveling with Tejinder. We have so much fun together even if it just sitting in front of a fountain because I am too sore to walk. He gives me so much energy and his support during the best and worst of times is invaluable. During the last mile and half of the race, I saw him walking to the finish line and called out his name. Just seeing his face smiling at me as I was running up the steepest hill of the race gave me the boost I needed to finish strong! 2) You CAN accomplish anything you set your mind to. There were times during training that I felt like I couldn’t do it and was ready to throw in the towel. But I pushed past those negative thoughts and preserved. And now I have a beautiful shiny medal hanging by my desk to remind me that I can do anything I set my mind to whether that is getting an A on my midterm or finding time to enjoy the things I once loved. You. Can. Do. It. Now that the race is done, I can focus on my next challenge - school. I hope my story inspires you to push through whatever journey you are on. Remember that you are capable of so much more than you can imagine. Also, remember to take the time to love yourself! Find the time to do your nails, bake cookies, go for a run, whatever it is that makes you happy. Because what’s the point of doing it all if you aren’t having fun!? Melanie and I met a few weeks into freshman year and I won’t tell you the whole story because it’s a pretty embarrassing story but, the point of it is that I met the person who would become my best friend for going on 10 years. The last decade has been filled with Starbucks frappuccinos (something neither of us drink now), lunch from El Super Burrito, trips to visit each other during college, BBM messages (when they were actually cool), graduations, lessons in adulting, first loves, and more life milestones than I can count. The most beautiful thing about Melanie is that if she loves you, she will go to no end to make everything better. Whether we were 300+ miles away or oceans apart, she always made herself available to do whatever it took to make me feel better and loved. Melanie, this world is brighter and more beautiful place because of the endless amount of love you give to those you care about. Melanie met Patrick when we were juniors in college and it didn’t take me very long to realize he was the one. When you see the two of them together you just think “could there be two people more meant for each other?” The answer is no, there really can’t be a couple that competes with the special bond they have. So, when the fateful day came that Patrick asked Melanie to spend forever with him, I was bursting with tears of joy! And when Melanie asked me to stand by her on her wedding day as a bridesmaid, well I just nearly lost it. I mean, my best friend is marrying the man of her dreams!! But before the walk down the aisle, we celebrated her final days of being a single woman with a bachelorette party in Napa. On a warm day in March, Melanie and her entourage of 9 girls took to Napa for a fun-filled weekend of laughs, delicious food, oh, and lots of wine! The Westin Verasa - Katie, the MoH and the bride’s sister, hooked it up with a two-bedroom suite at the Westin Verasa. It was the perfect place to throw on a comfy robe, watch Bridesmaids, and put our feet up after a day of wine tasting. The location of The Westin Verasa could not have been any better. It is walking distance to downtown Napa where you will find boutique shops and restaurants. It is also close to the Napa River which is the perfect place for a post-dinner walk. The hotel is located across the Napa Wine Train which you could use to get from one winery to another if you do not have a DD. We opted to rent a party bus, because of course we would, and went with a local favorite, Deb from Driven In Napa Valley. Deb is the absolute best; she is professional, friendly, and knows how to have a good time. She has amazing connections and knows all the best spots. And, she’s a great photographer! Domaine Chandon - We started the day with champagne tasting at the beautiful Domaine Chandon. Is there a better way to start the day than with bubbles? At Chandon, there was a lovely creek that went through the main entrance and breathtaking views of the countryside. The tasting room was pretty busy the day we were there but the space is so massive that it didn’t feel crowded. There are benches, tables and chairs scattered throughout the campus, all providing a fun and intimate experience. Since we were a rather large group, we decided on two bottles of champagne, Brut and Rose, and found a nice spot under the trees to enjoy them. Andretti Winery - Our second stop was at Andretti Winery. You guys, this place was a stunner! It reminded me a lot of the old Spanish style homes with the courtyard in the center, complete with a fountain. At Andretti, you can go to the main tasting room or head to the house in the back for private tastings and views of the countryside. We tried a selection of different red and white wines while laughing over our favorite Melanie and Patrick stories. It was the perfect way to end our day in Napa. Napkins - After Chandon, we went to Napkins for lunch before heading to our next winery. Napkins is a local bar + grill located in downtown Napa that serves American classics with a global flair. You can enjoy your food and wine pairing either indoors on our their heated patio. Their menu was pretty meat heavy but Napkins has no problem accommodating dietary restrictions and provided menu recommendations and alternatives to suit my vegetarian needs. The atmosphere was young and fun, ideal for a day with the girls. Eiko - Sushi is my comfort food so you know I was excited for dinner at Eiko! Some people find comfort in mac and cheese, I find comfort in spider rolls. Po-tay-toe, po-tah-toe. The moment you walk into Eiko, you are greeted by a modern interior, Japanese influenced dining, and an overwhelming “I’m so cool for being here” vibe. You know which vibe I’m talking about. My favorite part was the Japanese characters that were wall papered up to the ceiling above the sushi bar. From the design to the menu, Eiko provided a complete experience. They offered the usual rolls and entrees along with their signature dishes and variations on Japanese classics. And since our hotel was walking distance from the restaurant, we walked off our sushi induced food-babies on our way back to the hotel. The Corner- What’s the best way to end a girls weekend? With a morning-after brunch, of course! We grabbed a table at The Corner, a local and tourist favorite located downtown along the Napa Riverfront. A restaurant by day and lounge by night, The Corner is serving brunch favorites with a Modern American twist and pairs them with hand-crafted cocktails, wines, and spirits. The interior of the restaurant is stunning. The exposed brick, tall ceilings, and beautiful behind-the-bar display was breathtaking even at 10 in the morning. And least we forget the wine store! Close your eyes and picture a library. Now imagine all the books in the library were replaced with wines from around the world. You are now picturing The Corner’s wine store. Bottles of wine from local California wineries along with world-class fine and rare wine collections are housed inside a climate controlled cellar. It is a beautiful, beautiful thing. Melanie’s bachelorette party was very true to who she is. The low key weekend was filled with good vibes, good people, and great wine. It was the perfect break from reality for some much needed girl time. Now all there is left to is watch my best friend walk down the aisle to say “I do” to the man of her dreams. And dance the night away, of course! Happy New Year, friends! We made it to 2017; a bit battered and bruised but we made it! If you’ve read my Mendocino post, you know that Tejinder and I have an annual tradition of taking an end of the year trip together. It is our time to fall off the radar, enjoy a few days without a schedule, and just mad chill. For our third annual trip, we starting researching locations that would: 1) be by the water, 2) be good for hiking, and 3) have great food. After doing a bit of research, Kauai felt like the perfect vacation spot so we packed our bags for a week on the Garden Island. Since the week of relaxing and exploring Kauai was simply too long for one post, I have broken up our trip into two parts. First up, the North and East Shores! The day after Christmas, Tejinder and I met bright and early at Oakland Airport for our flight to Lihue. We were fueled by excitement and Starbucks when we landed in Kauai a little before noon. Upon landing, we enjoyed the cool island breeze while we waited to rent our car from Alamo. My advice to anyone renting a car in Kauai is: 1) rent a Jeep and 2) go through Kauai Jeep Rental for the best rate. We reserved a two door Jeep Wrangler through their website and it was one of the best decisions we made! Reserving and picking up our car was so easy and in no time, we were on our way to Kapa’a to check into our hotel. Tejinder and I were both pretty ravenous at this point. Okay, I was the ravenous one but I was ravenous for the both of us! We made our way to Bubba’s Burger in Kapa’a. Bubba’s has been serving no-frill mouthwatering burgers since 1936 and they have no plans of stopping. Their veggie burger was so juicy and if you are vegetarian you will understand how unheard of that is! Paired with fries, a banana shake, and an ocean view, it was the perfect first meal on the island. We spent the rest of the evening unwinding and unpacking before driving to Safeway to buy a few snacks for the week. Have you ever heard the phrase “Island-time”? It is a time zone in which literally no one is in a rush, ever! No one is ever in a hurry to get anywhere or do anything. Tejinder and I got a serious dose of “island-time” on our way to Safeway because the speed limit on the highway we were on was 45 mph. We were both baffled! For those people who are like me and have no idea how to do anything slowly, don’t worry, island-time will grow on you. On our first full day on the island, Tejinder and I woke up rested and ready to explore Northern Kauai! We packed the car with water and snacks before heading to the North Shore. But first, bagels. Tejinder and I stopped at Java Kai for breakfast. This cute café on the east side of the island lives by the not so subtle motto “Drink Coffee or Die” and they also serve killer bagels, tea, sandwiches, and smoothies. Tejinder ordered an onion bagel with cream cheese, tomato, and pesto. You guys, the pesto changed everything. It was the unexpected thing you look for in a regular bagel and cream cheese breakfast. Java Kai has a very cool vibe, and even cooler apparel which you can buy from their online shop. After fueling up our bodies, we hopped into Sheeba (yes, we named our Jeep) and started on the one-hour drive to Ke’e Beach to hike the Na Pali Coast. The drive there was absolutely beautiful. It was like a scene from Jurassic Park or Lost everywhere you turned. The Na Pali Coast trail we chose was a 4 mile round trip trek that ended at Hanakapiai Beach. It rained in the morning so the normally dirt trail was pretty darn muddy. The trail itself is fairly steep with a few twist and turns. There are plenty of waterfalls, creeks, and lush greenery to enjoy as you make your way through the hike. And the views of the coast were just breathtaking! The trail hugs the coastline so we constantly had this amazing view of crystal clear waters as far as our eyes can see. Wear shoes you don’t mind getting dirty because there is a lot of mud and you will slip a few times and you will be upset if you take you new pair of Nikes. Bring an extra pair of shoes to wear after the hike. Again, your shoes will get muddy. Get there fairly early because parking is limited and you cannot park on the side of the road. We arrived around 9 AM and there was plenty of parking. When we left around noon, it was completely full. After our hike, we rested up at Ke’e Beach. The family friendly beach is the perfect spot to relax and soak your feet in the clear water. There is a small coral reef you can snorkel around in if you remember to bring your gear. We swam in the salty ocean water for a bit and relaxed on the beach before packing up Sheeba to go to Hanalei Bay. Hanalei is truly a beautiful place with an incredible beach that offers expansive views of the bay. There is a pier kids were jumping off of and families were enjoying tacos while taking in the spectacular views of the coast line. Since it is a bay, the waves were a lot calmer which makes it a great spot for paddle boarding or surfing classes. From Hanalei, we made our way to Kilauea, which is a few miles south. We grabbed lunch at Kilauea Fish Market – a quaint grub spot serving whatever fresh catch that came in that morning. And when they run out of the morning’s catch, they close up for the day. Their portions are large so come hungry! Five minutes away from the Kilauea Fish Market is the Kilauea Light House. Be sure to stop here and check out the awe-inspiring views of the ocean and Kauai coast. While we were there walking off our food babies, a very nice man named Jeff took our photos with the light house. Shout out to Jeff at Kilauea Light House! After a day filled with exploring the North Shore, Tejinder and I were both exhausted. Our night ended with a trip to the ABC Store which, if you’ve never been before, is like the 7/11 of Hawaii. ABC Stores are everywhere! They are a great places to buy souvenirs, snacks, and $2 wine (sorry Mom). Be sure to save your receipts because if you spend $100, they will give you a free gift! We stayed at Kauai Shores Hotel located on the East Shore of the island. The hotel was at full capacity the week we were there but it was so quiet you would not have believed it. The private beach is a short walk away and in the rare event you get tired of laying on the beach, you can lay out by one of their two pools. Our room was clean and the staff was extremely friendly. It was literally the perfect place for a relaxing getaway. Note: their WiFi is a bit spotty but you’ll be too busy sipping mai tai’s on the beach to notice. Because of its central location on the East side of the island, we were able to visit the many restaurants the East Shore has to offer and have listed a few of our favorite spots below. Trees Lounge – Never would I have guessed that Kauai is where I would find some delicious Cajun food! The Trees Lounge is a lively place to enjoy some serious creole classics, $6 martini’s and live music from the one and only Tom Selleck. Or at least a talented native musician named Tom Selleck. Be sure to finish your meal with their macadamia nut brownie! Wailua Shave Ice – Wailua Shave Ice is the spot to get some of the best, most flavorful (aka non-syrupy) shaved ice on the island. Their truck can be found on the East Shore serving up large portions of their tasty desserts. I will never be able to look at ice again after tasting mouth watering deliciousness of their Da Almond Joy. It is the perfect way to cool down and satisfy your sweet tooth. Kauai Bakery – On Tejinder’s island to-do list was to eat a malassada. We searched everyday we were on the island and finally found them at Kauai Bakery. Malassada’s are basically the Portuguese equivalent to a donut but without the hole. But if the cream and chocolate filling won’t help you forget the missing hole, the sugar coating sure will! Paired with a cup of coffee or tea and you’ve got yourself a sweet and scrumptious snack. Mark’s Place – Also on Tejinder’s list was a lunch plate at Mark’s. Located in Lihue, Mark’s Place whips up classic Hawaiian plate lunches, bentos, and salads. I will caution that their do not have many vegetarian options but if you are like me, and are okay with eating fish, get the sushi salad. It basically is carb lovers dream! The salad consisted of sushi rice, flakes of nori, wantons stuffed with crab, and kimichi bean sprouts. I was a little bummed at first that they did not have any veggie options but after trying their sushi salad, I wasn’t even mad. Be sure to stay tuned for Part 2 of our Kauai trip where I will take you along with me as we discover the South and West Shores!